Australians love dogs! Over 40% of all Australian households keep a dog (that’s almost four and a half million dogs!) – and they spend on average almost 500 hours a year (approximately 20 days) washing, caring for, exercising and feeding their pet. It’s a big commitment, especially when life is busy and time is precious – finding time to provide the care and attention your dog needs can be a challenge. At Jim’s Dog Wash Glenmore Park, we make it easy to keep your dog clean, washed and well groomed, and free of fleas, ticks, parasites and worms – and at a great everyday low price you’ll love, our services are packed with value and convenience. Customers in and around Glenmore Park, St Clair, Penrith, Erstine Park, Mt Druitt and Blacktown should give Kirstine at Jim’s Dog Wash Glenmore Park a call, and request their free no-obligation quote. As a fully mobile dog washing studio, we come to you with everything we need to care for the needs of your pet, while you are free to use that time for other important things! As a local of 31 years and with great experience working with animals, Kirstine is the professional groomer at Jim’s Dog Wash Glenmore Park. 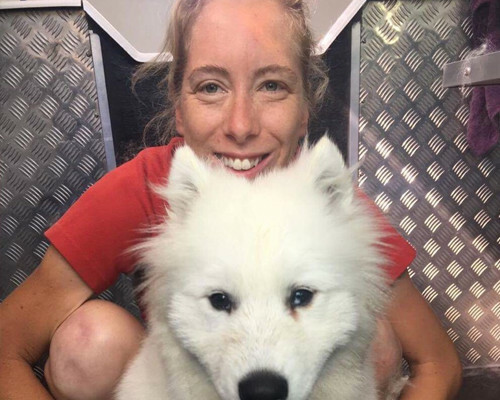 Committed to delivering first-class care and attention to every animal, Kirstine has a personality all dogs love, and works patiently with every pet to ensure they feel safe and secure, and enjoy the experience. We use only the best specialised products and equipment, and keep our trailers immaculately clean and well-maintained to ensure your dog is received in a welcoming and non-threatening environment. From a simple wash and dry right through to the full hydrobath and everything in between – all treatments are delivered with genuine care and finished with a yummy dog treat! Our facilities include fresh warm water, clean towels, blow-dryer, after-wash cologne, nail clipping, traditional and contemporary clipping and trimming services, worm, flea, tick and parasite treatments, and a well stocked range of dog collars, coats, leads and toys. We look after your dog with passion and dedication – either on-call, or for pre-arranged sessions taking the hassle out of organising. Our prices are fantastically competitive – and we offer a 100% customer satisfaction guarantee for every service. You can’t go wrong with Jim’s! Ensure your dog is healthy and happy – with Jim’s Dog Wash Glenmore Park – call today for your free no-obligation quote.